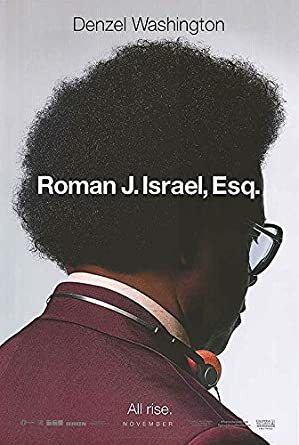 There is a fantastic movie hidden somewhere in Roman J. Israel Esq. Somewhere along the way it becomes lost, maybe because it is a movie trying to do many different things, or be many different types of movie all at once. Part political-commentary, part-social commentary, part-thriller and part-drama. It does a lot of things well but doesn’t add up to the compelling movie that this could have been. This is a shame because at it’s core is a great performance from Denzel Washington. Washington fits into the role of quirky, lost-in-time Israel and gives a performance that shows yet another side to his skilful acting. Considering this year sees him return to the role of the Equaliser, it is amazing how versatile he still is. There are also plenty of great moments which Washington gets to work through. A simple court procedure turns into a demonstration of his core beliefs and desire for justice. This is pushed even further when “villain” George Pierce (played by Colin Farrell) leads Israel into a precarious situation regarding a lawyer’s confidentiality privilege and abuse of power. As previously mentioned, this is a film of many different commentaries on the state of the world today. It touches upon the big-business versus small-business, the unfairness of the justice system regarding petty criminals and even the progression of social justice movements and protests. All of this is seen through the eyes of an old-man who has been left behind as the world progressed. This makes for compelling watching in the first half of the movie but then Israel makes a fateful decision, trying to bring himself up to the 21st century and unfortunately, the “story” truly kicks in and the messages that this movie was trying to convey in the first half gets lost in the pursuit for some kind of “thriller.” The film doesn’t get particularly worse but does lose some of the intrigue the first half gave you. It is a perfect example of a movie trying too much all at once. It touches upon a lot but doesn’t delve deep enough into any of those topics to be effective. Much more care is needed and it needs proper unpacking to really convey the message it seems to be trying to express. It becomes even more irritating when Washington’s performance is so effective. Overall, Roman J. Israel Esq. is a movie that has a lot of good, clear messages it wants to convey and unpack but fails to do so effectively. It has a great core story too but this actually takes away from the movie’s better elements. Luckily Washington continues to offer his usual, excellent performance. July 21, 2018 July 21, 2018 Ben2017, Awards, Colin Farrell, Denzel Washington, Lawyer, Movie, Oscars, Review, Roman J Israel Esq.